Coventry's only specialist reptile shop! We are an independent shop in the centre of Coventry whose goal is to provide you with the best advice and equipment that you would need to own a healthy reptile. Katie and her business partner opened the doors of KBN Reptiles on 5th March 2011. In 2012 her business partner left and her boyfriend at the time Luke took his place. After 3 years, Luke left to pursue his own passions and Katie's best friend Kane joined. Since 2011 the shop has come a long way and now has an extensive breeding programme with many species and has expanded into many different product lines too. We have a great giftware section selling lots of different gifts such as fossils, ornaments, jewellery, toys and handmade pictures. Katie is the owner of KBN Reptiles, she has been working with reptiles for over 13 years and her expertise is lizards, geckos specifically. She has a wide range of knowledge in most areas of reptile keeping including lizards, snakes, chelonia and some invertebrates. She has experience working with many animals. Studying at Moreton Morrell College she then moved on to working in a pet shop, Stratford Upon Avon Butterfly farm and ending up in a fish and reptile shop before opening KBN. Reptile keeping is her passion and animals are her life, she opened KBN Reptiles to educate people about the amazing world of reptiles. Kane studied computer science in his home town of Sheffield and kept reptiles as a hobby at home. 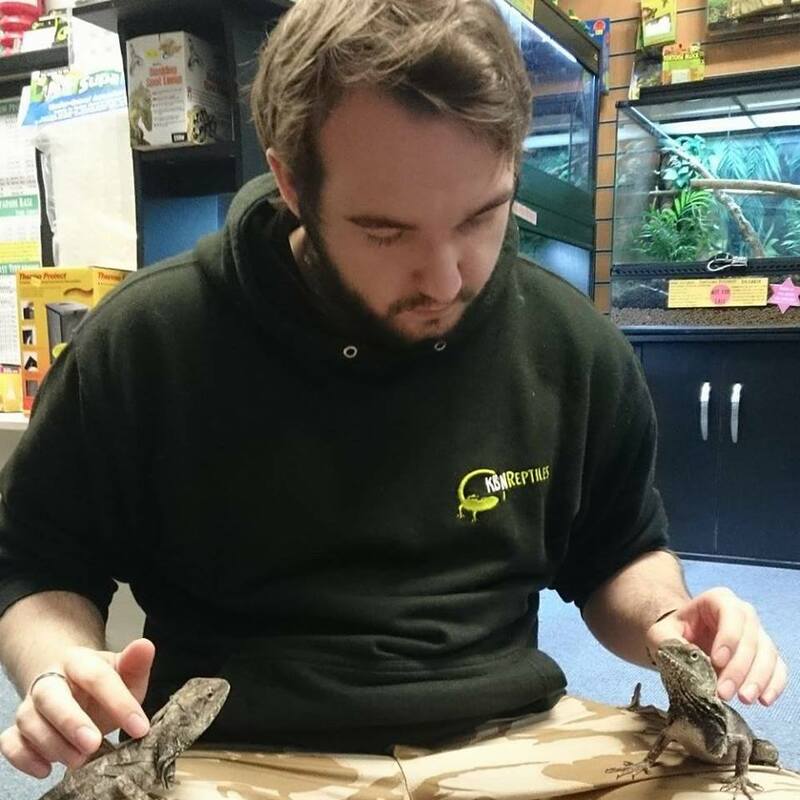 He soon discovered that his passion was growing and wanted to pursue a career working with reptiles full time. A chance meeting with Katie saw the opportunity of this becoming a reality and in December 2014 he moved down to join the KBN team becoming part owner in 2016. He has brought with him a wealth of experience in keeping and breeding Asian ratsnakes. His areas of expertise also extend to invertebrates, Tarantulas specifically and also monitor lizards. Nigel is Katie's dad, he helps in the shop 4 days a week and can normally be found sitting next to the livefood shelves. He is quality control when it comes to our livefood stocks and maintains the high quality that we pride ourselves on, if you ever need information on how to keep your livefood alive longer, just ask him! Nigel creates the bags of substrate that make up our wide range of substrate available and also specialises in Bearded dragons. Debbie is Katie's mum, she helps out in the shop on Thursdays. She is responsible for feeding the animals and the wide variety of species of stick insects that we sell and is usually getting shouted at by Nigel. Other member of the team include volunteers, work experience and of course Katie's niece, Willow who helps whenever she is at the shop. She is normally showing people around the shop, tidying up or waiting to serve people behind the till.